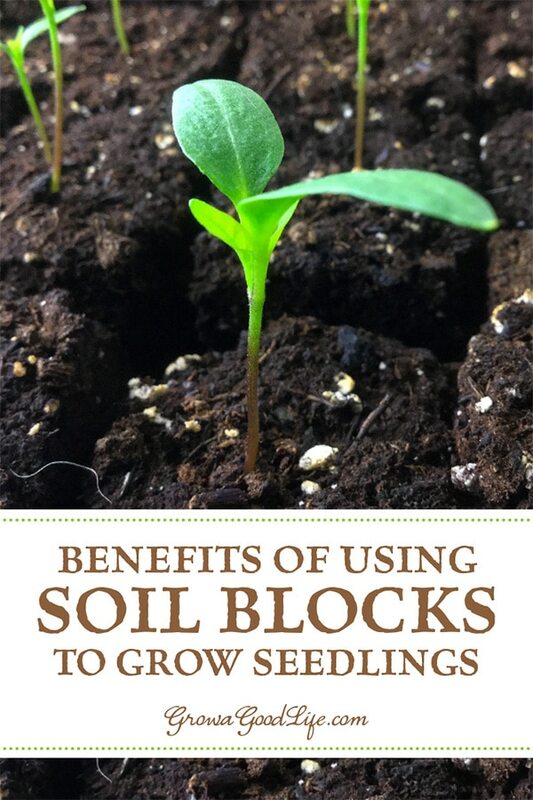 A soil block is a cube of lightly compressed soil and nutrients that will grow one seedling. When the plant is ready to be transplanted, the entire block is planted into the soil. No root mangling will reduce transplant shock. When I first began gardening, I purchased transplants from a local nursery and had a difficult time getting the seedlings out of their individual cells. Often times the plants were root bound and suffered from transplant shock because of my mangling. 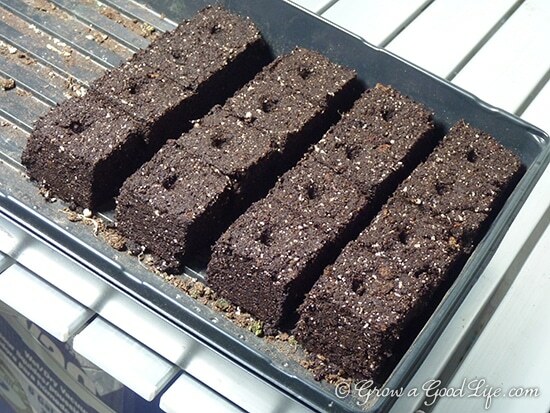 Once I decided to grow my own transplants from seed and assembled a Grow Light System, using soil blocks for growing seedlings appealed to me. Since the soil block serves as the container and the soil, it is easy to transplant without injuring the roots. I learned about soil blocks from reading Eliot Coleman’s book, The New Organic Grower. Part of the charm was that the soil blocker was an investment that would be used for many years to come. No need to invest in plastic cell packs that crack and break over time or peat pots that constrict the roots from growing. I also liked that transplanting soil blocks allows the seedlings establish quickly into the surrounding soil with no root damage. What is a Soil Block? A soil block is a cube of lightly compressed soil and nutrients that will grow one transplant. I start all my seedlings in soil blocks that I make with a 2-inch Soil Blocker that produces four soil blocks at once. Soil blockers are the spring-loaded tools that form and compress the soil mixture into blocks. Once ejected, each block has an indentation at the top of the cube to plant your seed. Soil blockers are available different sizes but I use a 2-inch Soil Blocker. Soil Block Makers are available at Amazon and other places online. Seek out the quality Ladbrooke brand and it will last forever. Eliminates the need for plastic cell packs or peat pots. Since the soil block functions as both the container and the soil for starting and growing seedlings, this reduces the need for plastic growing pots. Seedlings develop a stronger root system. More oxygen is distributed to the roots since the growing medium is not contained. Roots are also “air-pruned” once they reach the edge of the block. This means that they stop growing rather than winding themselves around the plastic pot seeking nutrients. Transplants establish more quickly. Since there is less disruption to the roots, the seedlings are less prone to transplant shock. Eliot Coleman’s recommended soil block recipe is composed of peat, lime, coarse sand or perlite, fertilizer, compost, and soil. Just like any recipe, this one can be altered and adjusted to accommodate the ingredients you have on hand. I have experimented with different mixtures and found that as long as the mixture holds together, it will be fine. I have settled on a mixture of organic seed starting mix, screened compost, perlite, and a little all-purpose granular organic fertilizer. The ingredients can be easily found at your local garden center. I have linked to sources online for examples. Use a 10‐quart (2.5 gallon) bucket to measure the bulk ingredients and a standard measuring cup for the other ingredients. You can mix and store the soil block mix in a 12 or 15 gallon storage tote and scoop out as needed. 1 cup all-purpose organic granular fertilizer (such as Espoma Garden Tone). 1. Add peat moss and lime to your large container. Mix thoroughly to combine. 2. Add perlite and organic granular fertilizer. Mix to combine. 3. Add the garden soil and compost. Mix and store until you are ready to use. This recipe makes about 8 gallons of soil block mix. When you are ready to make your soil blocks. Scoop out the soil mix into a flat container, such as a dishpan. Add hot water and let it sit for a few hours or even until the next day. This gives the mixture ample opportunity to soak up as much water as it can. Once mixed, the soil should look like peanut butter. Add more water, or reserved dry mix to adjust. To make the blocks, pile the soil mix into a mound that is about double the height of the soil blocker. Then simply plunge the soil block maker into the mixture. Twisting the blocker helps compress the soil and release it from the mixture without sucking out the wet soil back out. Do this three times so cubes are filled tightly. 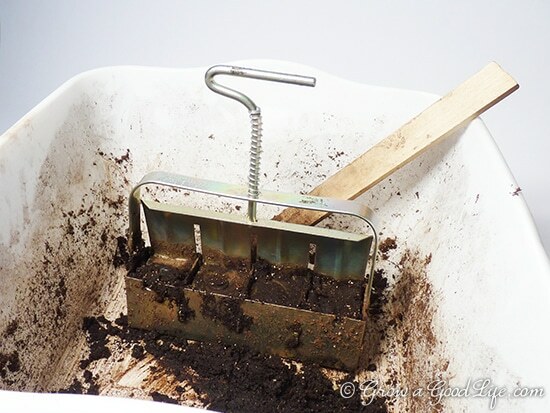 Scrape off the bottom of the soil block maker with a straight edge, then set the blocker in your seedling tray and release the soil blocks by pushing down on the handle and lifting the blocker. The blocks should be firm. If the blocks crumble, add more water to the mix. If they slide out easily and fail to hold their shape, add more dry mix. Plant your seeds directly in the depressions created by the soil blocker. Label the soil blocks using tape on the outside of the tray. As an added bonus, the soil blocks are easy to move around and organize. If a block fails to germinate, it can simply be removed from the tray and recycled. Also, it is easy to know when it is time to transplant the seedling or pot up into larger containers because you will see the roots when they reach the edge of the block. Out of all the gardening tools and gadgets I have purchased over the years, this soil block maker is one of the most useful. A soil block maker is a great investment that will serve you well for many years. Great post!. Could you share the recipe you use that uses organic seed starting mix, compost, perrlite, and fertilizer? Also can you share what brand of seed starting mix and fertilizer you use? Thank you! 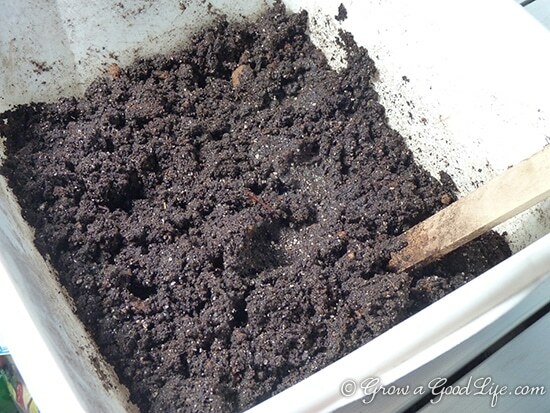 Deb, the recipe for making soil block soil in in the article above. I try to stick to local brands and those vary. If you are using premade seed starting mix, just substitute it for the peat moss or coconut coir, and garden soil. It doesn’t have to be exact. In fact, if I am making a quick small batch, I don’t measure anything. I have used soil blocks for several years in 3 sizes: the 3/4″ micro, the 2″ mini and the 4″ maxi. The soil recipe I use is very similar to the one here. I have had great success with this method. Most seedlings are started then transplanted to the garden in the 2″ blocks. Some require more time indoors (with my short season I need as much advance growth as is reasonable), and those are transplanted directly to the 4″ block before being transplanted outside. I have mostly stopped using the 3/4″ micro block, as I have found it often unsuccessful and unnecessary. I also use these blocks to start seedlings for my greenhouse, as it allows me to keep one plant growing to harvest while another is getting started. This way I make the most use of my limited space. Please tell me about the watering for your seed blocks. And do you use trays with holes or without holes? I am going to order one of these soil block makers right now! Evelyn, I use double trays, one with holes that hold the soil blocks, and one without holes. Watering is easy this way, just add water to the tray and allow the soil bocks to absorb as much as they can, then lift the inner tray and drain off any excess water. Thank you all for the great tips and inspiration! Winters are long here in Maine especially when one doesn’t participate in outdoor activity until the Robins are pulling worms! 🙂 I may be older but I still enjoy the smell & feel of the cool dirt on my skin! Suann, I agree, winters are long here in Maine. I love starting seedlings indoors, under lights. It allows me to enjoy digging in the dirt a little. Thanks so much for this! I am getting ready to start using soil blocks for me farm in Spring. One thing I am not sure about is if I should purchase Johnny’s 512 soil block mix or if I should make the mix myself. In Elliot’s recipe there are a lot of ingredients I am not sure where to get. I was happy to read that you simplified it a bit and it still works. I think using a soil mix like you use will probably be much cheaper, right? Lee, Yes, it is less expensive to mix up your own soil block mix especially if you are starting a lot of seedlings. The key is to screen out larger chunks so the blocks hold together. For fertilizer, I use Espoma Plant Tone because it is easy to find in the winter. I will also water the plants with diluted fish emulsion to give them a boost if they look like they are struggling. I have my soil blockers ready and a bag of McEnroe Organic Potting Soil mix i squirreled away last fall. I have heard good things about the Vermont Composting stuff but there is only one dealer in the area who usually runs out by spring. I start peppers and tomatoes in 3/4″ blocks to save space on the heat pad, then transplant to 2″ blocks. Brassicas and lettuces get the 1″ blocks. Starting seeds indoors is a nice antidote to this horrible winter. Bought the soil block maker 2-3 years ago, never got around to use it, thanks for the tutorial, it’s very helpful, I’ll try it out on my next batch of seeds. I saw one of these at a friend’s farm years ago. Now I know what it’s for… Hoping to get one soon so I can start greening the world 🙂 Thanks for sharing. Sergio, Thanks for stopping by and leaving a comment. I love my soil blocker. Starlight, Yes, plenty of time to dream and start seedlings under lights here too. I don’t transplant my heat lovers until around Memorial Day. I don’t regret investing in the soil blocker. It certainly saves me from having to wash out all kinds of little pots. I saw your post on the 104 Homestead Blog Hop. I’ve never heard of seed blocks before – love the idea! Barbara, Thanks for stopping by and leaving a comment! I love learning different things from fellow bloggers. Reading Eliot Coleman’s books influenced me to use soil blocks. I love how they work. I love my blocker too, but I use the 1 1/2″ one. I tend to grow my transplants for about three weeks so it is large enough for that. Four weeks is OK too, but more than that with most is bad. Though my onions tend to be stuck in there for about 8 – 10 weeks poor things. But then again they are slow growers. Daphne, I agree that four weeks is probably the max. I do pot up the tomatoes, peppers, and eggplant. The rest of the soilblocks are usually transplanted into the garden. Mike, Even wiggling it back and forth as you charge the blocker helps compact the soil in the cells. Charging it several times also pushes out any extra water too. I’ve always imagined that these would fall apart during watering. Surprisingly they don’t fall apart if they are compressed well. I water gently in the beginning to make sure all sides are watered. As the seedling grows, the roots help hold the block together. At this point, I usually bottom water and the liquid is drawn up through the block. I can’t wait to break out my soil block maker this spring. I used to make my own mix as well with pretty good success but now I buy it. Vermont Composting Company has an organic potting mix that makes wonderful soil blocks. We hae friends visiting us from Vermont a couple weeks ago and they were kind enough to bring me enough of the potting mix for this year’s growing season. I have read good things about the Vermont Composting mix for soil blocks. Lucky you to have a friend bring some when they visited. What seems to deter a lot of people from considering soil blocks is the soil mixture. Most any mix that holds together will work. Great thoughts about soil blocks! This is my third or fourth year using blocks. While they are a little more work up front, for all the reasons you give and even more, I’ll never go back to containers and trays! Canadian Sphagnum Peat: The DO look like cake don’t they? The soil is compact enough to hold together and withstand watering, but porous enough for water to drain and roots to grow through. The soil must not be hard or intact so that the roots can freely grow. Thank you so much for this interesting post. Deb Fitz: That sounds like a great mix. There is not right or wrong mix. Just experiment and figure out what works for you. I think the ease of transplanting is the largest benefit to using soil blocks. Soil block are great! I’ve been using a mix of 1/3 garden mix (from the local landscape company…it’s just dirt and compost) + 1/3 peat moss + 1/3 vermiculite and the blocks hold together just fine…they are SO easy to transplant! Meemsnyc: I had to invest in seed starting equipment last year anyway since I was starting from scratch. So purchasing the seed block maker seemed smart since I will be using it over and over through the years. I really like the way it works. Liisa: Try mixing up a small batch to see how it works. I also loved the wooden boxes in the “Grow Biointensive” videos. Some were 6-inch deep, so I imagine the crops grow just like normal until space opens up in the garden then they continue to mature in a shorter amount of time. Robin: I like that I only have the trays to clean every year instead of all the little cell packs. I have always had difficulty getting seedlings out of the cell packs. Transplanting or potting up the soil blocks is really easy. I think it is worth the investment. Sinfonian: Experimenting is the only way to really figure things out on our own. I tried using straight seed starting mix and the soil blocks crumbled when watered as well. I also tried using straight compost without sifting and these didn’t hold up well either. So now I sift out the little chunks in the compost before mixing and everything holds together much better. Then when the roots grow, they help hold the block together as well. Laura (kitsapFG): I know the mixture will be easy for you to figure out. I bet a few test runs and you will be good to go. You probably already have the components on hand. They worked really well for the tomatoes and peppers. As I mentioned before, potting these up was really easy and there was no transplant shock because the roots are not disturbed. Great work! I love my home made single block maker, though some day I want the one you have. You may have seen my problems with my blocks on my blog. It was my laziness that caused it. I grabbed mostly finished compost and didn’t screen it at all. Threw in some vermiculite and water and presto, impromtu soil block mix. The blocks set up nicely, but crumbled later. May have been the worms in it. ROFL. Should work though. Just let them dry out before planting. I refuse to buy potting soil if I have compost. I suppose screening it would be a good idea. ROFL. Great post! 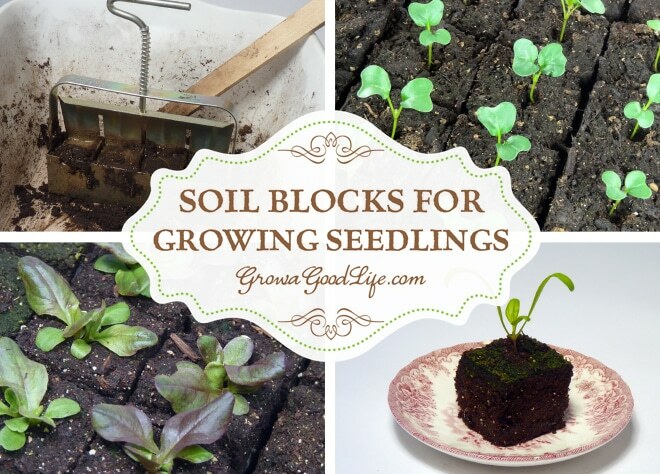 I have been growing my own seedlings for years but have never used soil blocks. From everything that I have been reading, I think that I will try them next year. Thanks for this post. I bought a soil block maker back in January but did have time to research the soil mix before it was time to get the seeds started for this year. I will definitely use it next year. I also want to check out the wooden seedling boxes that were shown in the “Grow Biointensive” Videos. This is so fascinating. I’ve never done this method before. Really like it! !